Grace E. Gray (1981) is a professional writer and editor, with publications that include scholarly articles on developmental neuroscience, feature writing, medical writing, nature writing, and interviews. She has been writing poetry as long as she can remember. Her only published poem, included here, is “Mexican Sunflowers,” which was published in Poet Lore, 2005. Hiding in the unpredictable shade. Groping after goldfish and water-lily roots. Run the length of the museum courtyard. Faking interest in the limp Tithonia and elephants’ ears. Too much tourism, and each other. Managed to get loose in that tired courtyard. Flying beyond my mother’s shadow to flare briefly in the sunlight. The tendons’ shiftless faux esprit. The doctors, aides, and her disease. Shall I, the daughter of such will, in turn infringe on death’s decree? Unlikely. I am too earthbound to spurn the earth that welcomes me. Besides, he died too young, now immortal like the youths on the amphora. If it broke. So, here’s the iron stand it stands in: No youth frozen on my amphora! From years of wear—the paint and pot are chipped– the wisdom to avoid anathemas. My last poem was an anaphora; this epistrophe, though anathema, is about an amphora. Copyright Grace E. Gray. You may not copy or publish these poems without the express consent of the author. 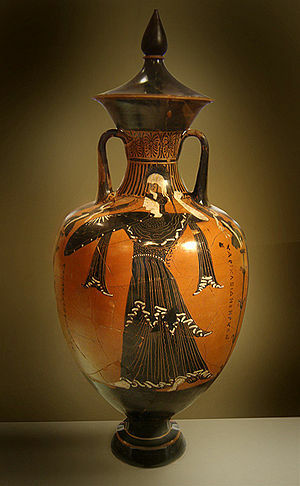 This entry was posted in Poetry and tagged Amphora, Anathema, Arts, Literature, poetry, Tithonia, Writers Resources, writing by Laura Gross Smith. Bookmark the permalink. Thank you for your kind and supportive comments! They are motivating me to send out some more poems for publication. I particularly enjoyed Mexican Sunflowers. The Mother’s face, an obstinate sunflower turned toward the sun.–brilliant imagery throughout. Vivid and ephemeral all at once. I can hear Pat’s defiant voice in the second poem. I love that unlike her, you are too earthbound to spurn earths eventual welcome. Grace’s poems have now been updated with the correct formatting. Please read her work again–it’s even better with the line breaks! The first poem, even without the line breaks and formatting, is breathtaking. It’s particular and gestural, and when you reveal that the daughter wasn’t even born yet, and then in the very next line have her throw up her hands – this is wonderful, wonderful. Congratulations, Grace. I hope to see more of your work. I agree with all Betsy says. The poem has powerful surprises throughout that delight the reader. Thank you for this poem.